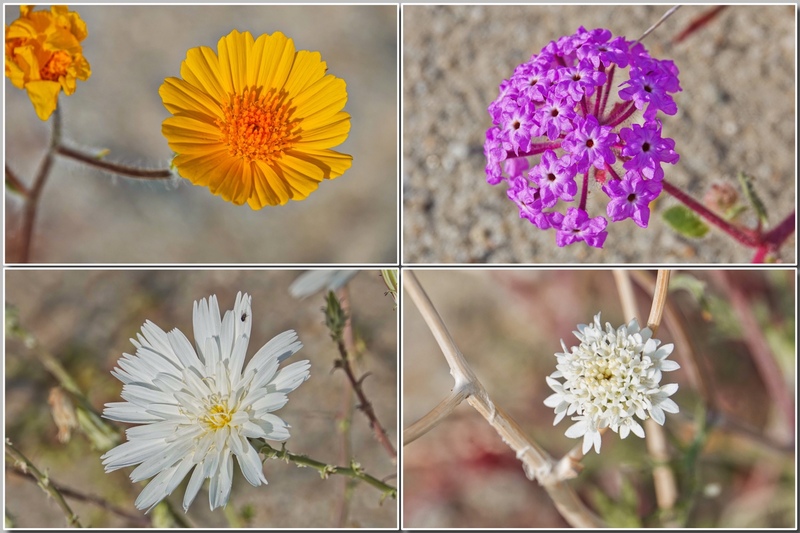 I got caught up in photographing the dried flowers and seed heads along the Canyon Trail at Bosque del Apache National Wildlife Refuge in New Mexico last week. For one thing I was testing the Macro Mode on my RX10iv, which I had just happened on while teaching a Point and Shoot Nature Photography class the day before. My theory is that if there is a specially designed mode for a particular situation, we owe it to ourselves as Point and Shoot photographers to see if it works. No point in doing it the hard way, if there is an easier way that gets the same results. 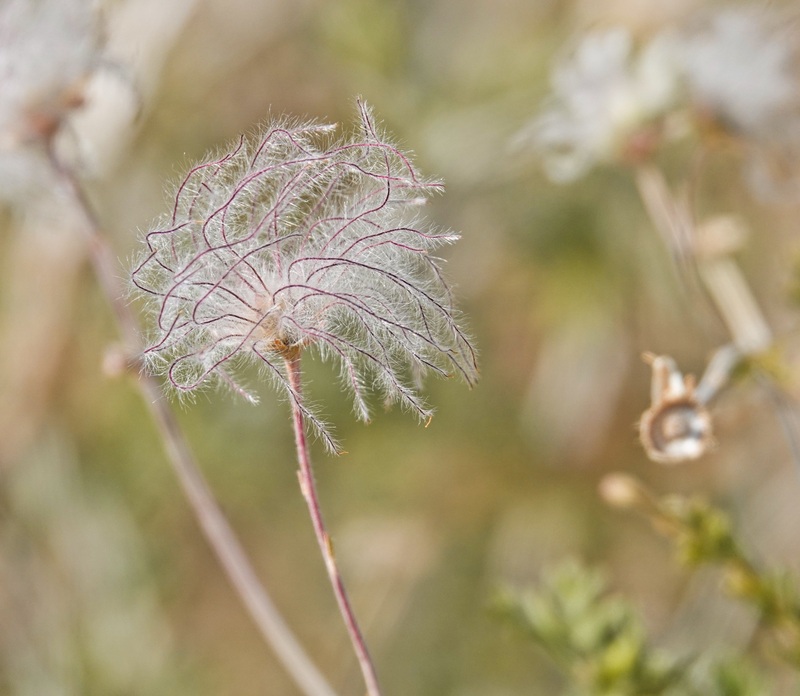 This is the seed-head of Cliffrose, which grows on dry hillsides all through New Mexico. It is also called, locally, Navajo Diaper. I always assumed, when I lived in New Mexico, that the Navajo somehow used the feathery seed-heads to line their cradle boards, but a bit of research this morning informed me that it is the shredded bark of the plant that they use, and that they weave it into a mat. Still, I have always loved the feathery delicacy of the seed-heads, and the beauty is, I think, particularly visible in this image. Sony RX10iv in Macro mode at 600mm equivalent. Processed in Polarr. 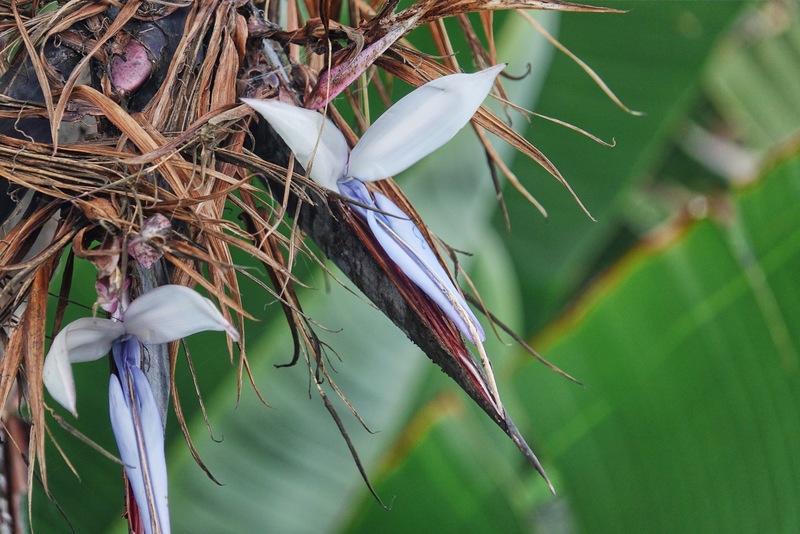 I always enjoy the many Bird of Paradise plants when I visit San Diego in February. The most common are the smaller varieties with the orange and bright blue flowers, but there are also many of the giant variety, with black, white, and pale blue flowers. The big flowers weather rapidly, and it is rare to see one in its full glory. These are just opening, quite fresh, and still very attractive. It is an odd view, as the flowers on the giant plant are generally above my head. This was taken from the balcony of my hotel room, looking down on the flowers. Sony Rx10iii at 435mm equivalent field of view. Program Mode. 1/250th @ ISO 200 @ f4. Processed in Polarr on my iPad Pro. I saw these giant thistles in bloom along the first mile of Blackpoint Wildlife Drive at Merritt Island National Wildlife Refuge in Titusville Florida every time I drove the loop, but it was not until my last visit of the trip that I forced myself to take a moment for a photo. I think they are just Bull Thistle, a common weed, but the specimens on Blackpoint were certainly spectacular. This was my 3rd and final thistle stop. I pulled over because of the particularly intense color but was rewarded with the perfect contrast in the Florida White feeding deep in the bloom. Sony Rx10iii at 24mm equivalent field of view. Program mode. f4 @ 1/250th @ ISO 100. Processed in Polarr on my iPad Pro. I took the new Ford C-Max Hybrid on its maiden photoprowl yesterday…a swing north to Saco Heath, then cross-lots on back roads to Route 1 and eventually to Cascade Falls and back home. I am not sure I have been to the Heath this season at all. I know I missed the early bloom of Rhodora and Sheep Laurel and High-bush Blueberry, and the Grass Pink Orchids. I was surprised to find the Pitcher Plants in full bloom. I had remembered them as early bloomers, but I was happy to be proved wrong. 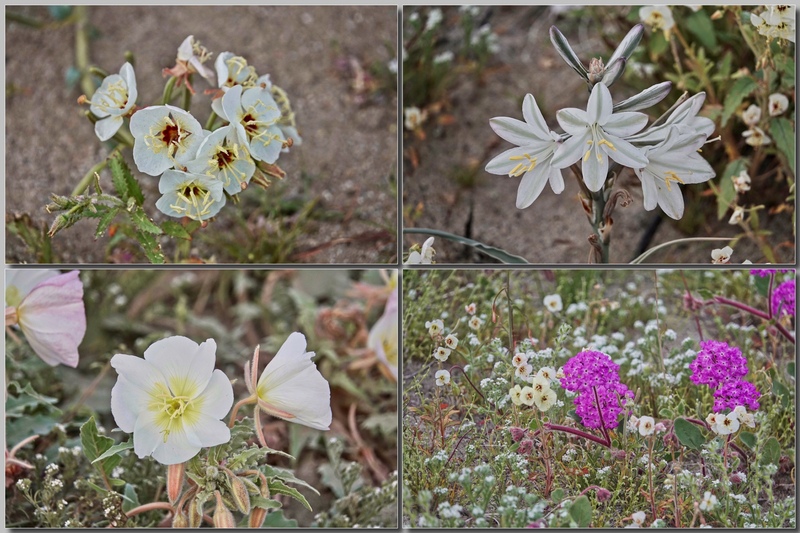 Not only were they in bloom, but there were more than I have ever seen on the Heath. Saco Heath, if you are just tuning in, is a raised peat bog, where the peat and sphagnum moss have risen above the level of the ground water. It is one of a very few in Maine and the only one in Southern Maine. 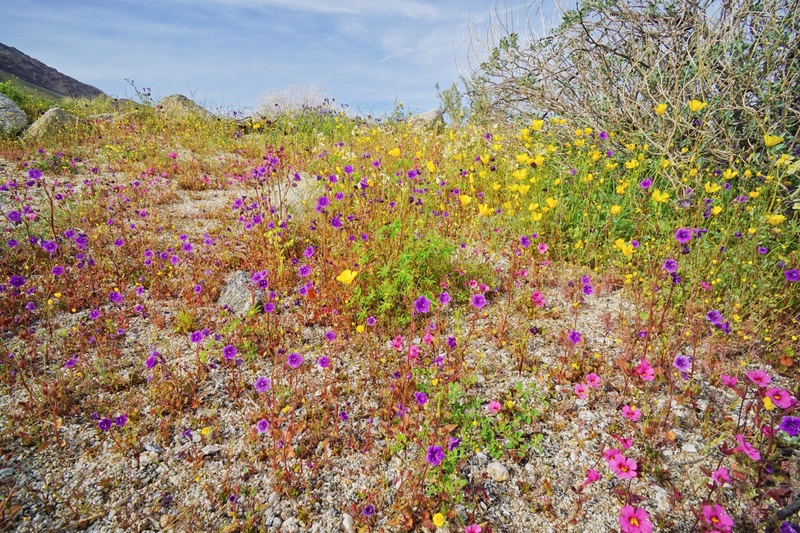 The environment in a peat bog is highly acidic and very poor in nutrients, so it is populated by a group of rare plants that are specialized to nutrient-poor soils, and by stunted Pitch Pines. There a slightly higher section of the bog that supports one of the only stands of Atlantic White Cedar in Maine. The area is protected by the Nature Conservancy, and by the State of Maine. A boardwalk, renewed over the past several summers by the Civilian Conservation Corps, runs right across the heath to a loop of trail in the Cedar stand. 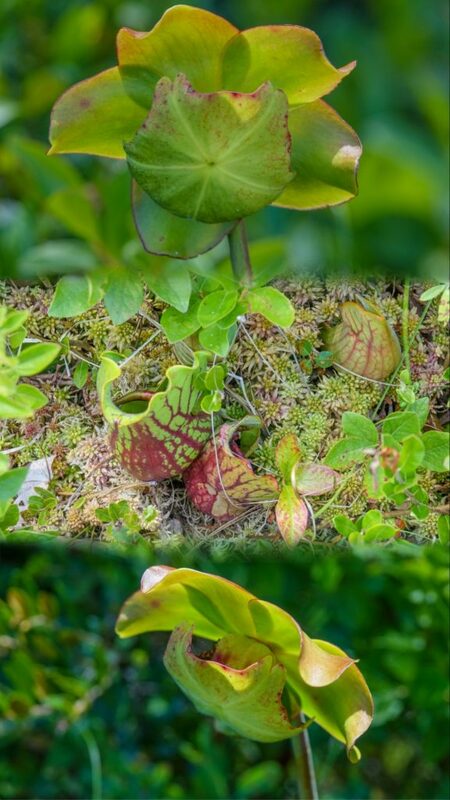 Pitcher Plants survive in the nutrient poor sphagnum surface by capturing and digesting insects. They are carnivores. The “pitcher”, a tube of adapted leaves, contains a digestive fluid at the bottom. Bugs crawl or fall in and contribute most of the nutrients the plant needs. 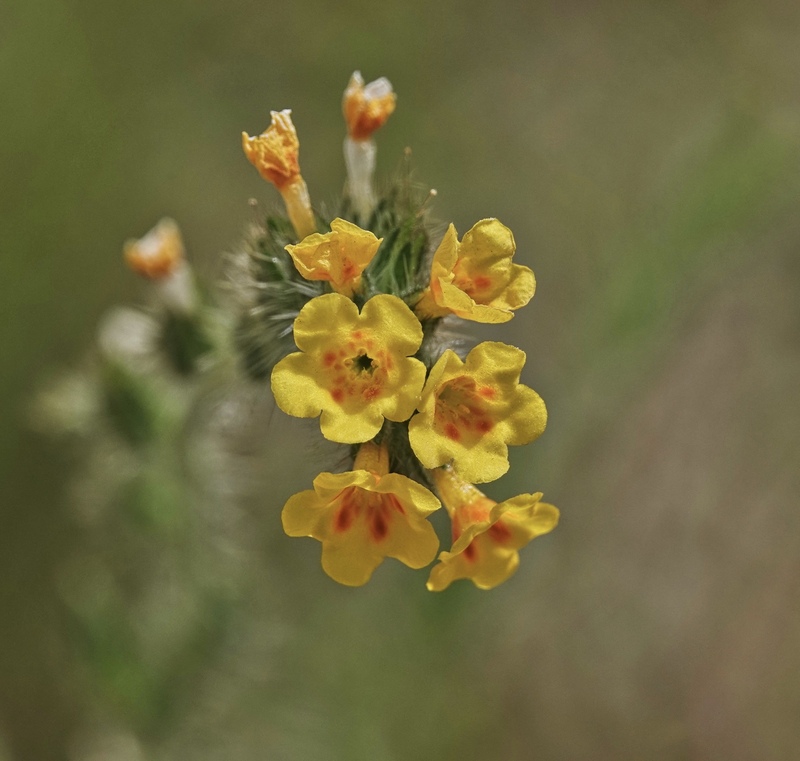 The flower is very large (3-4 inches across), on a tall stalk, and more “interesting” than “beautiful”. As I say, there were many of them along the more raised sections of the boardwalk in the Pitch Pine hummock, and along the edges of the White Cedar hummock. Sony RX10iii. The first shot is a telephoto macro and the bottom side-view is a wide angle macro. Exposure varied. I was shooting in Program and shutter speeds were from 1/60th for the pitcher shot to 1/320th for the telephoto. ISO ranged from 100 to 250. All shots at f4. Processed in Lightroom and assembled in Coolage. Northern Blazing Star, Kennebunk Plains Wildlife Management Area, W. Kennebunk Maine. 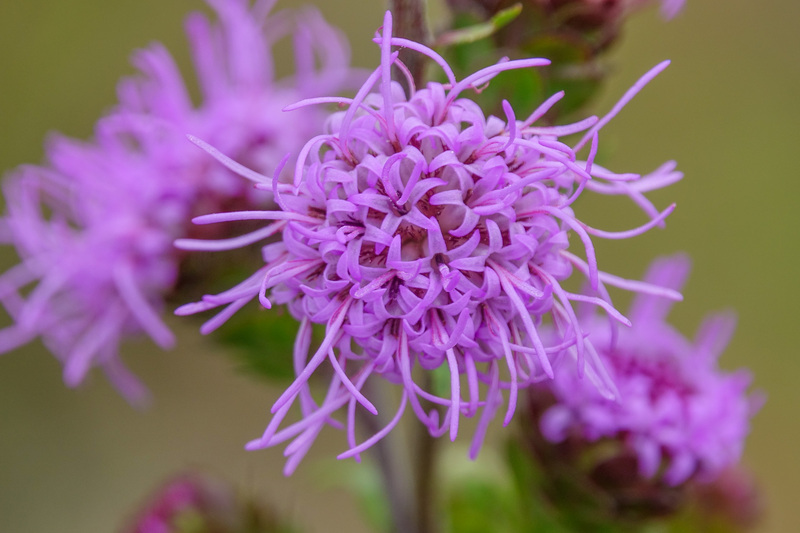 It is an amazing show when the Northern Blazing Star are in full bloom on the Kennebunk Plains Wildlife Management Area…as they will be in a few weeks…but this early, when there are only a few plants in bloom, I generally take better, closer, looks at this beautiful flower. 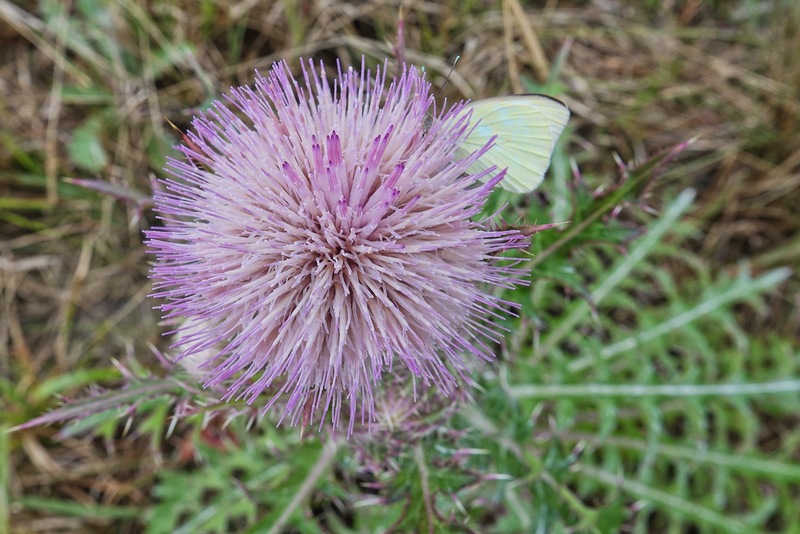 And, of course, not so much a flower as a cluster of tiny flowers making up a thistle like head. In this shot you can appreciate the beauty of the individual flowers. Sony RX10iii at 600mm equivalent field of view. 1/640th @ ISO 100 @ f4. Processed and cropped slightly for composition in Lightroom. 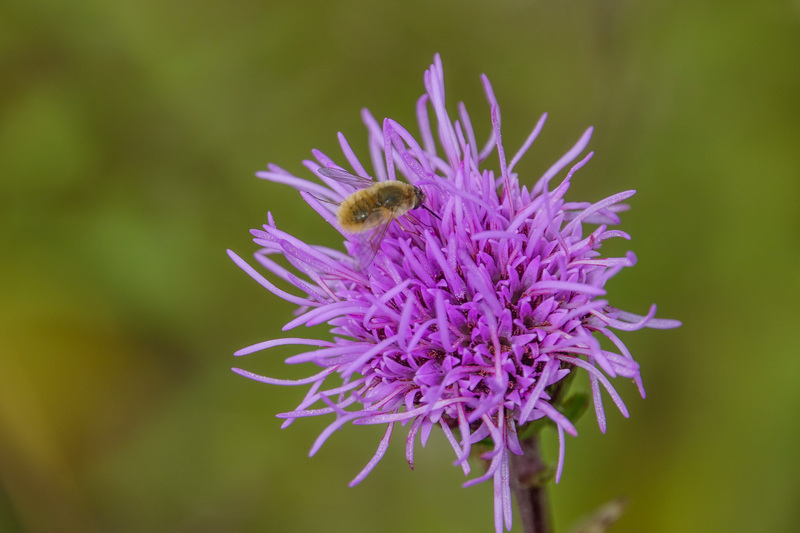 Bee Fly on Blazing Star. Happy Sunday! I am rapidly approaching 69 years old (next month) so I am always surprised and delighted to discover something in the world right at my doorstep that I have never seen before. Seen is a tricky word. I suspect that I have seen Bee Flies before now…but I certainly never looked at them. I did not know they existed. If fact, when I bent down to take a photo of this very early Northern Blazing Star, in flower on the Kennebunk Plains Wildlife Management Area yesterday, I though I was looking at a bee. It is furry like a bee. It has superficially bee-like wings. It was behaving like a bee…but I knew it was no bee I had ever seen before. I had certainly never seen a bee that color or with that long a proboscis. A little googling (small hairy bee with long proboscis) brought up the Bee Fly family. Ah…not a bee at all. A bee mimic. And a bee parasite. (The female lays her eggs at the mouth of the hive of ground nesting bees, and the fly larva attack the larva of the bees.) There are many species of Bee Flys in North America (over 4500 world-wide)…all I can say for certain is that this is NOT the most common of them: the Greater or Large Bee Fly, which is sometimes called the Dark Edged Bee Fly because the wings are dark edged and patterned like those of a hummingbird moth. I was also surprised, by the way, at the number of Northern Blazing Star plants in bloom already on the Plains. While it is far from the show I expect in two weeks (the normal timing of the bloom), our unusually hot July must have forced many plants into bloom early. The Blazing Star on the Kennebunk Plains is, as far as I am concerned, one of the highlights of the natural seasons here in southern Maine. It is endangered in most of North America, and the Kennebunk Plains is one of the few places it still grows in abundance. The Plains can be purple with it in mid-August. So that was two surprises for yesterday…and one “the surprise of a lifetime” in that it was my first real look at Bee Fly. And of course that is the thing about the generous eye…always open and ready to be surprised. Another translation of what Jesus said about eyes, from The Message Bible, is “‘If you live wide–eyed in wonder and belief, your body fills up with light.” 69 years on the planet, and I can still be surprised by the living nature around me…by God’s loving invention…I am still discovering new wonders. And each new wonder only confirms and strengthens my belief. This is good. And it is my hope for you, whatever your age, this Sunday!